6:23’ min 3 channel video installation. Amongst sweethearts Claudia Hart, LaTurbo Avedon, Rick Silva, Phillip Stearns, Mary Ann Strandell and Rollin Leonard its little me, showing a brand new, 6+ min long render of DCT:SYPHONING @ Transfer Download at Minnesota Street Project in San Francisco. This HUGE, beautiful install (thanks to Harvey Moon, Kelani Nichole and Barry Threw) is up until September 7th and def. worth a visit. Come by, it looks like we will even be hosting a Sunday Salon on the 14th *check for confirmation the Facebook event. I will be there iRL! My first time on the west coast! Every image plane environment is made in a 3D environment and per environment artefacts from another realm of compression form the textural basis of the chapter. 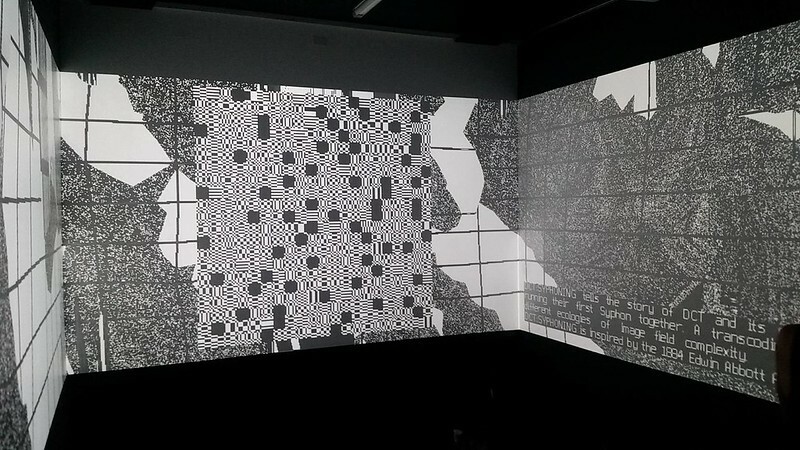 The text of the narrative is encoded in DCT, a form of ‘encryption’ for which Rosa Menkman won the shared first price during the Crypto Design Challenge in 2015. DCT:SYPHONING tells the story of DCT and its offspring, DCT Junior, who, on its 64th interval, runs its first Syphon. A transcoding trip through the different ecologies of image field complexity. Senior introduces Junior to the different levels of image plane complexity; together they move from the macroblocks (the realm in which they normally resonate), to dither, lines and the more complex realms of wavelets and vectors. The story tells how junior reacts to old compressions technologies, but also the newer, more complex ones which ‘scare' him because they are not legible to him. DCT:SYPHONING is inspired by the 1884 Edwin Abbott Abbott roman Flatland. DCT:SYPHONING was commissioned by the Photographers Gallery in London for the show Power Point Polemics.